The New Ford Kuga - Sales hit 1,800 before Wheels hit forecourts! Get’em while they’re hot! 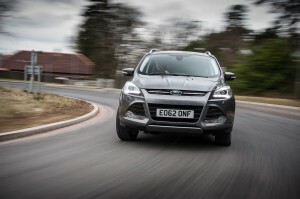 New Ford Kuga Sales hit 1,800 before arriving at dealerships! Ford has revealed that it has sold more than 1,850 of its all-new Ford Kuga models before dealer deliveries have even begun and 1,600 of those are to private buyers . Bizarrely, the majority of buyers have ordered one without even taking it for a test drive. And more than 85 per cent of sales to British customers are the top Titanium and Titanium X models. The Kuga is an impressive car and 98 per cent of the pre-orders are specified with optional extras such as driver assist technologies with are costing buyers another £1,000. The car is fitted with the impressive 1.6litre turbo-powered EcoBoost engine which is making its debut on the Kuga. The all-new Kuga builds on the success of its predecessor with a sophisticated design, elevated driving dynamics with an inventory of sophisticated driver-assistance systems including Torque Vectoring Control, spacious rear package with greater flexibility, a wider choice of low CO2 powertrains, a wealth of smart technologies and the five-star Euro NCAP safety rating. Overwhelming demand for the Kuga’s top Titanium and Titanium X models has already prompted Ford to consider extending the range further upwards with a new flagship model later this year. Prices for the Ford Kuga start at £20,895 on-the-road (though, from experience, it might be worth checking out the leasing packages available for the Kuga before putting an order in). This entry was posted in 4X4 Car, Car Updates & Releases, Family Car, Popular Cars and tagged car, Euro NCAP, ford, Ford Kuga, impressive car, kuga, LS, New Ford, New Ford Kuga, price, private buyers, smart, Torque Vectoring Control by Steve Lumley. Bookmark the permalink.